Facebook was invented by Harvard computer science student Mark Zuckerberg along with classmates Eduardo Saverin, Dustin Moskovitz, and Chris Hughes. The origins to the name hints as to the history of Facebook, however, the website was originally and briefly called Facemash. Mark Zuckerberg was a second year student, when he wrote the software for the Facemash website. Perhaps, it was Zuckerberg's sophomoric sense of humor that led him to create the site as a type of "hot or not" game for Harvard students, where website visitors could compare two student photos side-by-side and let viewers decide who was "hot" and who was "not". Mark Zuckerberg put his computer science skills to good use by hacking into Harvard's security network and where he copied the student ID images used by the dormitories and used them to populate his Facemash website. Fashmash opened on October 28, 2003,and closed a few days later, shut down by Harvard execs. Mark Zuckerberg faced charges of breach of security, violating copyrights, and violating individual privacy for stealing the student photos he used to populate the site. He also faced expulsion from Harvard University for his actions. However, all charges were eventually dropped. 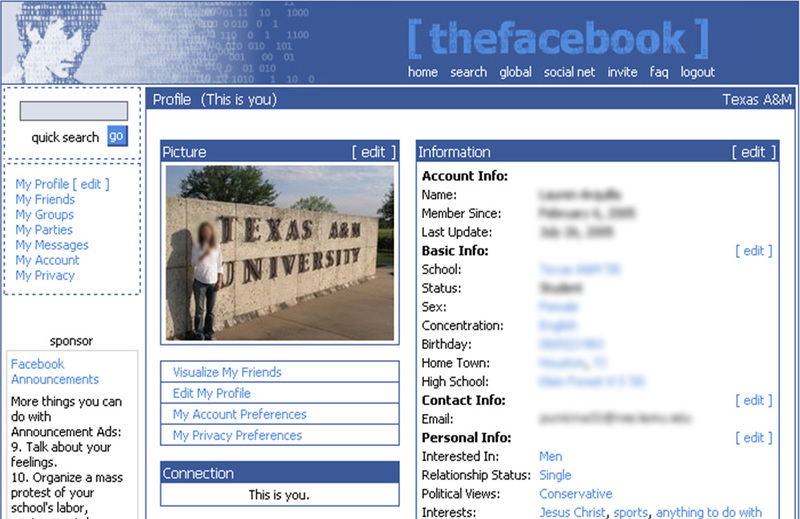 On February 4, 2004, Mark Zuckerberg relaunched with a new website "Thefacebook". Six days later, Mark Zuckerberg again faced trouble when three Harvard seniors, Cameron Winklevoss, Tyler Winklevoss, and Divya Narendra, accused Zuckerberg of stealing their ideas for an intended social network website called HarvardConnection, and of using their ideas for TheFacebook. Winklevoss, Winklevoss, and Narendra later filed a lawsuit against Zuckerberg, however, the matter was settled out of court. Membership to the website was at first restricted to Harvard College students. Zuckerberg enlisted a few of his fellow students to help grow the website: Eduardo Saverin worked on business, Dustin Moskovitz as a programmer, Andrew McCollum as a graphic artist, and Chris Hughes. Together the team expanded the site to additional universities and colleges. In 2004, an angel investor, Sean Parker (founder of Napster) became the company's president. The company changed the name from TheFacebook to just Facebook after purchasing the domain name facebook.com in 2005 for $200,000. Mark Zuckerberg's antics finally did pay off when profits from Facebook made him the world's youngest multi-billionaire. Kudos goes to Zuckerberg for spreading the wealth around, according to the NYTimes, Facebook CEO Mark Zuckerberg donated $100 million dollars to the Newark, New Jersey public school system, which has long been underfunded.